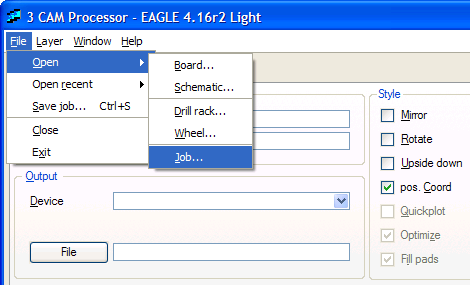 The Eagle PCB design software isn't the most user friendly in the world, however it's the most popular and really cheap. I do not plan to ever write a basic Eagle tutorial, but you can find a list of Eagle tutorials on my Eagle 3D tutorial page. This tutorial assumes you have already designed your PCB. This tutorial will show how to export your Eagle gerber files if you ever wanted to manufacture a PCB. You simply output the proper files (takes minutes), zip up the files, and then email them to your favorite PCB manufacturer. First, in the Eagle Board window, select File->CAM Processor. Then in the new window, click File->Open...->Job. You will now see a list of default PCB gerber processing files. You first want to select gerber.cam. Note that you may get the error 'aperatures missing' in a later step. If that happens, simply return to this step and use the gerb274x.cam file instead. A new window should open up, allowing you to customize the gerber file. It will work without any changes - just click Process Job at the bottom and you're done. 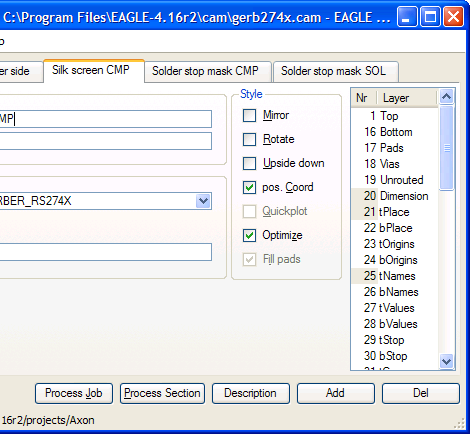 Depending on what you want, you may want to turn on/off some layers in the Silk screen CMP section, as you may not want all those Eagle labels cluttering up your PCB board. If you don't know what each layer is, go back to the Eagle Board window and click View->Display/hide layers... and independently turn off various layers to see what happens. Now run excellon.cam for the drill files, and click Process Job just like with gerber.cam. If you were to also get your board assembled/propagated (components soldered on) by the manufacture, you need to create a BOM file (parts list, or bill of materials). This file lists several things, such as part names, part centroid data, quantity, etc. Save it as a .txt file and open it up in a text editor. And don't forget to change any part names to match the labels of the parts you are shipping to the PCB house for assembly.